We are amused to read Westminster Tory Councillor Danny Chalkley’s latest proposal to employ Civil Enforcement Officers (CEOs – also known as parking attendants) to ‘gently’ warn motorists when they have parked their vehicle illegally, as opposed to automatically issuing a Penalty Charge Notice (PCN). This has come to us as a complete shock following Chalkley’s recent proposals to extend parking control hours from 6.30pm to midnight in an attempt to balance the council’s books, which show a massive budget overspend of £22 million. It sounds like Chalkley has recently pissed off thousands of Westminster residents, commuters, visitors and businesses with his ridiculous parking policies, purely designed to rescue a broken Conservative lead council. The extension of parking control hours after 6.30pm would generate an enormous loss of £70 million for the West End theatre industry. Motorcyclists have been protesting for the past 18 months at the imposition of a parking tax on them by Chalkley, who has simply refused to properly consider thousands of objections, which all requested him to scrap the charge. With the Westminster Council elections taking place this coming May and Councillor Chalkley, together with his Tory colleagues, having pissed off thousands of local voters, we wonder whether their latest move to let motorists escape from their parking contravention without penalty is not a desparate last minute attempt to regain thousands of potential lost votes. Have Chalkley and his chums realised that they’ve just gone a step too far with their parking policies to the extent that they fear losing the forthcoming elections? We strongly believe that, should Chalkley be re-elected in May, the minute that follows his re-election, he will instruct all CEOs to issue tickets again as normal. What actually made us smile is when we heard that Chalkley was going to ask CEOs to look for any parking signs defaced by graffiti. 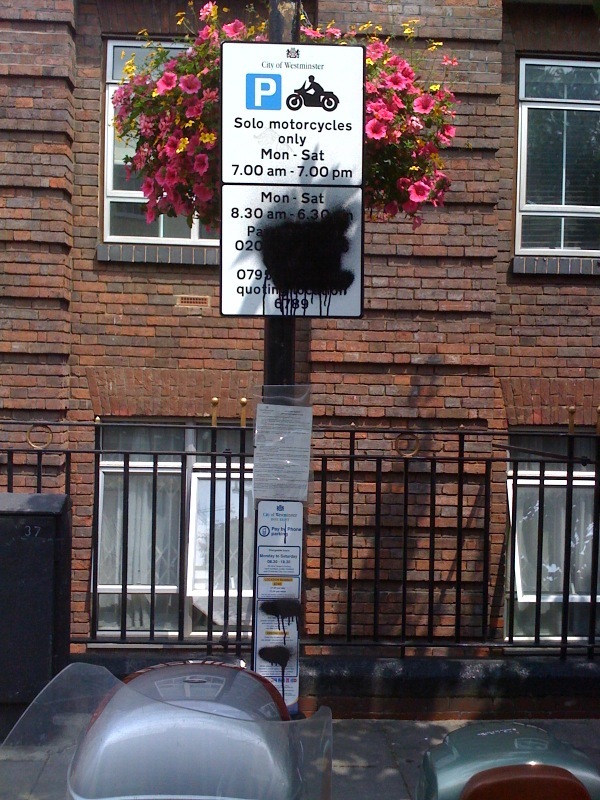 Since almost all the signs that have been defaced to date in the Borough of Westminster are for motorcycle parking, it is clear that Chalkley’s intention is not to give any concessions to motorcyclists. He hates motorcycles, we very well know that, and all he’s interested in is make money out of bikers, who use a non-congesting and less polluting mode of transport to benefit the environment. Cllr Chalkley is simply pulling the wool over poeple’s eyes, no wonder with the elections around the corner he thinks he can keep the voters happy by apearing to be considerate for the next 3 months…. There is a horror story about Westminster parking racket in the press every other day, even in national newspapers, and television. The reputation of this council has been battered.